Bose speakers are amazing in audio quality and distinctive in sound performance. Bose SoundTouch 10 speaker delivers an amazing music experience. Its compact and its popular amongst music fanatics and teens. If you compare the speaker with other models in this range, then this one is not only flexible but also durable. Bose SoundTouch 10 speaker is designed for multi-room audio. This feature can give you a better sound quality than a television or a radio set would do. The multi-room setup is kind of similar to a Wi-fi speaker. The Bluetooth integration of the speaker is also great. 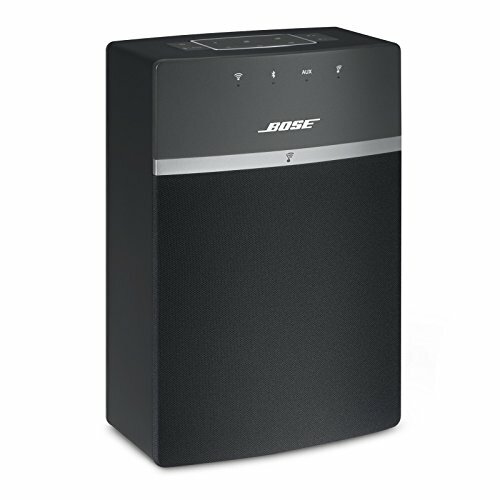 Bose SoundTouch 10 speaker has simple easy to use presets. Bose SoundTouch 10 speaker is a very versatile speaker as it provides great connectivity and room-filling sound. The best part about the speaker is that it integrates with Google Alexa. If you love a hands free experience and you enjoy total wireless control then this is indeed an ideal speaker for you. Though not a portable speaker like the Bose SoundLink Mini II yet wins on its feature list and sound quality, It provides non-dynamic sound at times but that again depends on your use. The speaker has many other features that will surely entice the music lover in you. Bose SoundTouch 10 speaker indeed gives you a great music performance. If you are a total app person then you must buy this compact speaker. It not only integrates with the app but also lets you access Google Alexa. This actually saves a lot of time. It works with almost all the Bluetooth and wi-fi devices to play your music loud and clear. It integrates with Spotify, Amazon music, and other music apps to play your music live. The streaming is also good so there is no problem with connectivity. You also have an option of six presets and a power button. App integration is the best part about Bose SoundTouch 10 speaker. Is it for party mode? Well, yes you can use the speaker for your house party as the speaker gives a room-filling music experience. Though, it’s not apt for bigger parties or lounge parties. It can be an ideal choice for small spaces or a cozy bedroom experience. Even if you play the music on full volume, the sound remains the same. You can enjoy hands-free music experience with Alexa enabled devices. You can also connect to various other devices to enhance your music and audio. The overall controls give you an amazing quality. It’s the best compact speaker by Bose. There are many great features of the Bose SoundTouch 10 speaker, let us look at some of them. Bose SoundTouch 10 speaker is the smallest SoundTouch speaker from Bose that delivers full sound and perfect rich music experience. It is perfect for your indoor parties. The speaker integrates with Bluetooth devices and streams music on the go. You can play your music through Pandora and Amazon music, it sounds great in any setup. The multi-room feature of the speaker gives you amazingly clear sound quality. The speaker lets you pair up to 10 speakers together to play your music loud and clear. It also lets you play your music in stereo mode with left and right flexible options. Bose SoundTouch 10 speaker easily integrates with Google Alexa to give you a great access. You can change the volume options or tracks with the help of the voice assistant. It even lets you stream your music with various music apps. The speaker also integrates with sound touch app to give you easy access. You can change the music settings and control the speaker with the help of the app. It also features an intuitive remote with the sound. The speaker comes with six different preset buttons for instant listening. You can play party playlist or internet radio and add to your music library with the preset buttons. The speaker comes with a remote control and power cable so that you can access your music anywhere. The wireless network compatibility of Bose SoundTouch 10 is 802.11 b/g/n. The speaker is excellent in supporting different types of audio formats for enhanced music experience. It supports MP3, AAC, FLAC, Apple, and WMA. You can hear any track to enjoy your music sessions. The speaker also lets you connect to echo dot. This helps you to use your voice to play your tracks. You can also manage your Smartphone devices with the help of this unique feature. Its compact in weight but not portable. Though, you can connect the speaker to any output in any setup. It has a great set-up pairing support and that helps to give a very refined music experience. Bose SoundTouch 10 speaker is designed keeping in mind multi-room audio performance. It is small and compact but the sound is powerful. It features a metal speaker grill with awesome control options. In fact, six preset buttons let you integrate at the best. The build quality of the speaker is also sturdy. It’s not fully portable so you cannot really carry it along wherever you go. Still, the quality of the speaker is unmatched if you compare it with other speakers in this range. The design incorporates all the control options and that is a great feature of this speaker. Bose SoundTouch 10 speaker is a monophonic speaker with a single transducer. Though the audio of the speaker is clear, still you need to pair it up with two different devices to enhance the audio performance of the speaker. The bass base of the speaker is good but at times, it tends to overpower the treble base thus overpowering the mid-range of the speaker. It is good in low-frequency range and there is no distortion in the sound. The only issue is the balance. The speaker lacks that kind of a balance and tone. The quality affects the kind of music you are listening too. Still, the sound is good. The setup of the Bose SoundTouch 10 speaker is easy and the interface is clean. The software is simple and the controls are easy. In fact, you can easily set up the speaker using a sound touch app by Bose. SoundTouch application setup lets you control the music and change the settings. You can also control volume and other functions of the speaker through the application. It also comes with an intuitive mode that lets you access the music as per your choice. The interface is easy and there is no issue in controlling the application through the speaker. The speaker gives you a very synchronized sound performance. You get the same audio quality throughout the room. The room filling experience is great if you need to use the speaker for your house parties. The performance is like the sound bars that you plug to the corner of your room. Irrespective of the place, it gives you complete audio quality. The speaker is compatible with almost all the Bluetooth and wireless devices. You can easily connect to other speaker or device through the wireless feature of this speaker. The speaker may be compact in size, but it is indeed great in sound. Its compatible with Alexa voice control so that gives you an easy access to music. Bose SoundTouch 10 speaker has an amazing connectivity. The speaker connects to every Bluetooth device. It easily integrates with other SoundTouch speakers to give you amazing music clarity even if you play your music loud. You can get a stereo sound performance when you connect the speaker to other devices. It easily lets you stream any music without disturbance. There is no battery in the speaker as it’s not portable. You need to connect through the app or any other device to play your music. It comes with a cable for your easy access. The connectivity of the speaker is simply good. Sound can differ at times. Suffers in the high range. If you want a multi-room experience, then the Bose SoundTouch 10 speaker is the best in class. Its performance is not that amazing for the price it actually offers but the sound is still fine. Being compact, it is easy to set up the speaker according to your need. In fact, it is the most popular speaker available if you compare it with other speakers in the similar price range. The only issue with the speaker is that it is not portable. If you need a speaker for your traveling needs, then this is not a feasible option for you. However, the sound is good; it is feasible for your music sessions. It is an ideal choice if you want to listen to music in a confined space or small space. Design wise also, the speaker is not that great. It does not really appeal in looks. At times, the sound performance is non-dynamic, so it actually depends on the music. Overall, it is a good speaker for its price.